Gaming News: "Sony & Nvidia 4-ever"
After having just completed the graphics processor for the PS3, Nvidia has been contracted to do further engineering work for Sony. Details about the project have not been released but is likely to be more lucrative than the $30+ million Nvidia made during their work on the PS3. 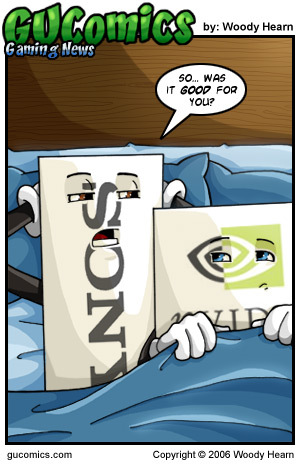 After reading about their contracts with Sony for the PS3, and now this, I think we can safely say Nvidia is firmly in bed with Sony no additional pun intended. The writer of the article goes on to posit a possible direction for the project: the Sony Vaio. It's a reasonable assumption given that the RSX graphical processing unit Nvidia made for the PS3 is now complete and it's unlikely that the gaphical processing unit inside the PSP will be changed within its lifetime. But again, it's all conjecture. Now if you guys'll excuse me, I'm going to scrub my brain clean with a nail brush and some Ajax.